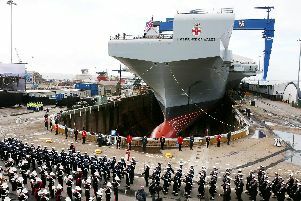 A RADIO DJ gave his listeners the chance to bid for HMS Queen Elizabeth to blast its horn on a ‘special occasion’. BBC Radio 1 breakfast show host Greg James received a call from the future Royal Navy flagship yesterday. With the HMS Queen Elizabeth wanting to take part in the presenter's ‘Hootenanny'. Greg James had encouraged his listeners to blast their horns all at the same time during a section of a popular dance track by Australian DJ Fisher called ‘Losing it’. The ‘Hootenanny’, as it was dubbed, had lorries, buses, cars and even cruise ships involved. And the £3bn Royal Navy aircraft carrier didn’t want to be left out. Ringing into BBC Radio 1, AB Jess Rogers. who serves on HMS Queen Elizabeth, said: ‘I want to be part of hootenanny, sorry we are a week late we really want to be a part of it. ‘We are on HMS Queen Elizabeth, the new aircraft carrier. ‘We have one horn and its got a five mile radius that it can be heard from. ‘I am in the seamanship department, I steer the ship under the captain’s command and we drive the sea boats so when we’ve got a man overboard we go and rescue him or her. He asked if HMS Queen Elizabeth could blow it’s horn live on the show, however he was told no. And this time the Royal Navy's aircraft carrier agreed to the DJ's request. ‘Okay so HMS Queen Elizabeth will give us the horn when we want it,’ he said. ‘We need something proper good then because I don't want to waste this. People were given the chance to bid for the horn to be sounded on a special occasion by texting Greg James on 81199 but only yesterday. The Royal Navy confirmed to The News that it was a one off and you could only bid on February 7 - so please don’t text the number with your bids! HMNB Portsmouth tweeted yesterday: ‘Did you all hear AB Jess Rogers from @HMSQNLZ chatting to @gregjames on @BBCR1 just now? What special occasion would you like HMS Queen Elizabeth's horn to be blasted for? Let us know in comments below!